On Wednesday morning, we left Wall and made our way through the edges of the South Dakota Badlands toward Mt. Rushmore. We stayed on the interstate although the scenic loop through the Badlands was only 43 miles. We hadn’t yet fully acclimated to the amount of freedom our schedule provided. We were still able to see the Badlands though. Admission to Mt. Rushmore is free but there is a charge for parking in the multi-level parking structure. Your parking fee is a one-time payment valid for the entire calendar year for that vehicle though. When initially conceived, the sculpture included Lewis & Clark; Bill Cody and Red Cloud, a Sioux Chief representing heroes of the west. To increase its appeal, a national focus was determined to include the four Presidents we see there today. Doane Robinson, a South Dakota historian, is credited with being the initial champion of the concept. 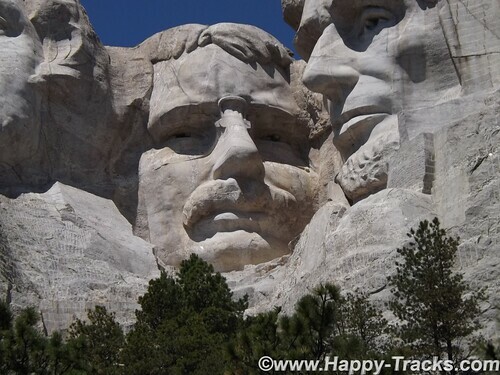 Roosevelt: Economic development of the USA, world prominence or the forward thinking of a National Parks system. There was some thought of expanding the sculpture in 1937 to include Susan B. Anthony but the legislation precluded expansion, or scope creep. The original plans included sculpting from the waist up but construction stopped as it it is today in 1941. We also ran across at least one reference that Calvin Coolidge declared that the four chosen had to be party-balanced. With all that background out of the way, I want to make sure to pass along that it is truly magnificent and breathtaking. Beginning with the roadway in, the scenery is fantastic and there are ample opportunities to view the surrounding landscapes from various locations. Once you’ve parked, you enter the National Monument by passing the gift shops, information booths, exhibits and eateries. Leaving there, you proceed along a majestic walkway adorned with flags from every state leading towards an amphitheater that allows you to just sit and stare or contemplate. From there, you can walk along a path (handicap accessible) towards the base of the monument. 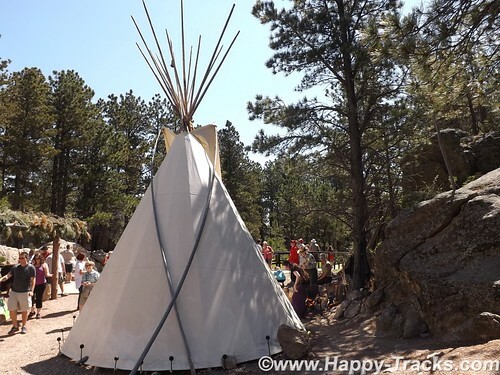 Along this path, you can see a more natural surrounding and eventually reach a display that includes some teepee structures and an exhibit of a small Native American camp with music and a Ranger-provided talk. 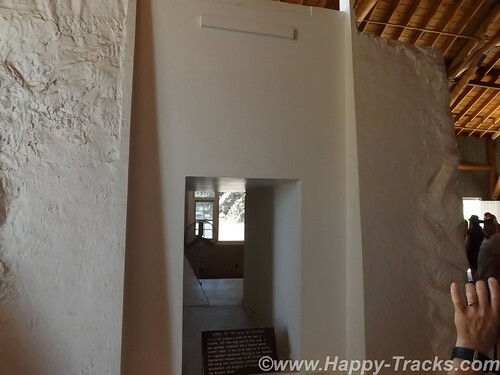 From that point, you can look up at George Washington’s chin and proceed further along a trail in front of the base. I’m not certain of the official rating but that part of the trail, while still relatively easy walking seemed to not be accessible to some with handicaps. This part of the trail seemed to provide a spot where you could view each President individually. 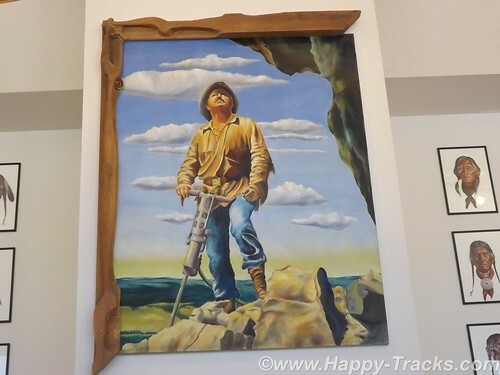 As the boardwalked trail becomes steeper, you eventually wind your way down to the artist’s studio where there are several displays including mockups of the initial sculpture. Outside there is an old generator and compressor setup that was used in the carving. Surprising to us, there is a mockup of a Hall of Records, an archival room for documents relating to the construction of the monument. 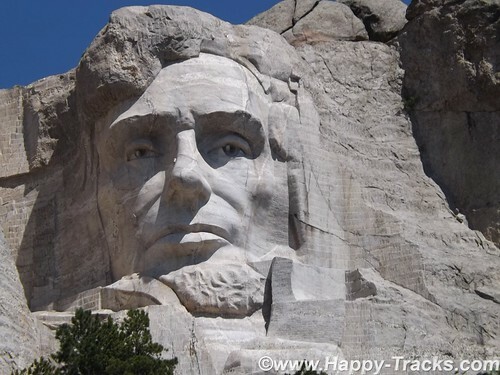 While not initially included, it has eventually been built and really exists behind President Lincoln’s head. 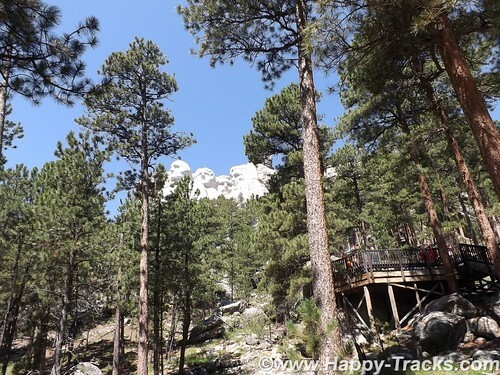 We climbed the uneven and steep (but solid) stone stairway back up to the entrance plaza were we lunched on bison burgers before checking the gift shop for postcards and continuing on our way to our next stop. 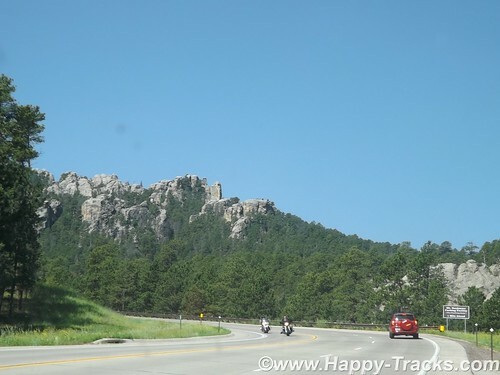 Just 16 miles away, on the other side of Harney Peak in the Black Hills National Forest is a memorial in progress, the pink-granite monument to Crazy Horse. 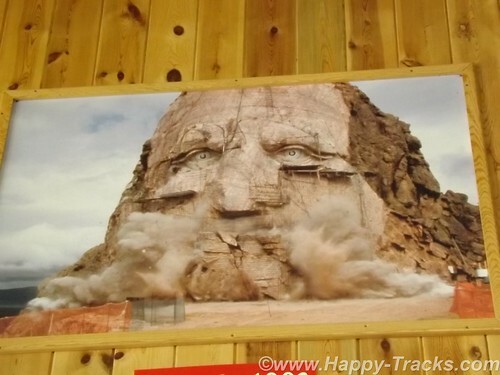 The Crazy Horse monument is privately owned and financed and has refused government funding. 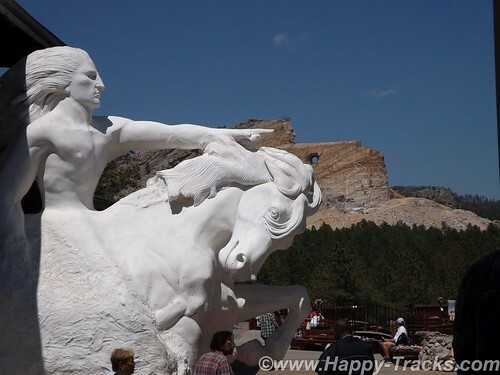 There was some disagreement about who the model for the sculpture should be and Crazy Horse was eventually chosen as he had a reputation for fairness and a dedication that shunned the limelight. Ziolkowski had worked with Borglum on the final stages of Mt. Rushmore for a time. Conflicting stories appear as to whether he left because the work was done or because of a falling out. At any rate, in 1947, Ziolkowski had been convinced and returned to begin the work. The first blast was in June 1948. As he was working with limited funds, he was also using used equipment and with limited funding, he was often working by himself. He would tell stories of starting the compressor for the drills and beginning the long arduous ladder climb and hear the compressor chug to a halt before he had reached the top and was able to start working, necessitating the long climb down the mountain to restart the equipment and cimb back up. According to our tour guide, Ziolkowski would work while he had funds and then would stop and do other things, including cutting timber from the property to sell. 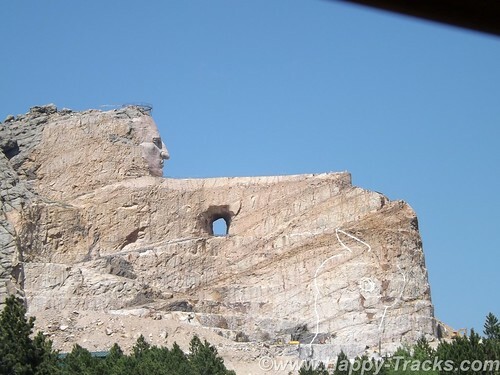 He also managed to buy up parcels of surrounding land and sometimes trade with the NPS to allow them to build contiguous parcels around Rushmore while he gathered contiguous parcels around the Crazy Horse Memorial. 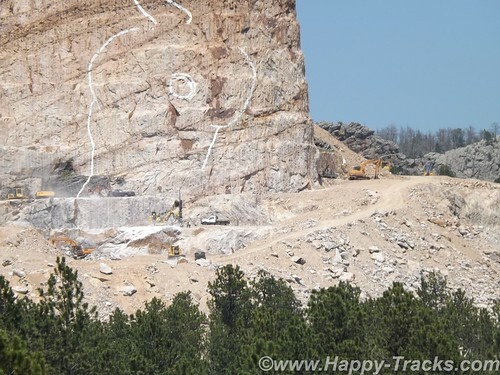 This is the largest in-progress stone sculpture in the world. 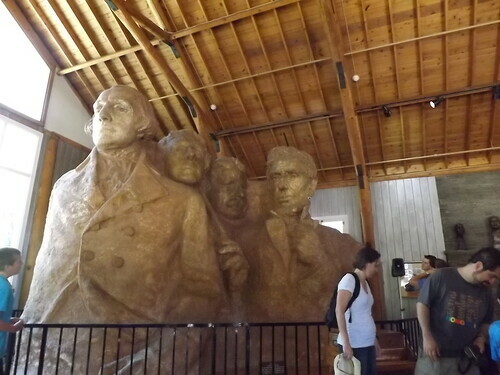 By way of comparison, the four Presidents’ sculpted heads (at 60 feet each) could all fit inside the horse’s head. Mr. Ziolkowski knew the sculpture could not be completed in his lifetime but he took on the project anyway. To believe in a vision that you know you will not see completed and to sacrifice to make it happen is a strong story, especially in this day of instant gratification. He married in 1950 and they had 10 children, six of whom remain involved in the foundation and the sculpture today. He died in 1982. His wife, Ruth, ran the foundation until her death in May 2014. When asked, Mrs. Z declined to provide an estimate of the expected cost of the monument, saying only that she expected the funds invested in the first 50 years was likely less than the cost remaining. She also expected that the timeline would still stretch for decades. 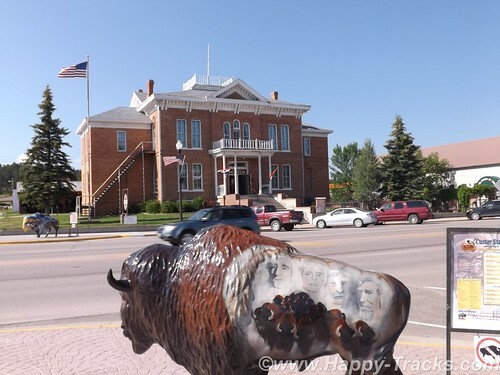 The Ziolkowski’s started a foundation which includes the museums and a scholarship fund, primarily for Native American students attending schools in South Dakota. The annual visitation for the uncompleted monument is over 1 million and the grounds include a museum of Native American life as well as the sculptor’s home. 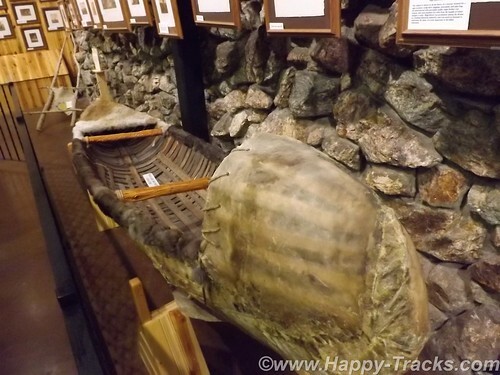 Additionally, the site includes a shop where Native crafters display and sell their wares. The first definable feature, the rider’s face, 26.67 meters (87ft 6in) high, was completed in 1998, in time for the 50th anniversary of the very first blast. 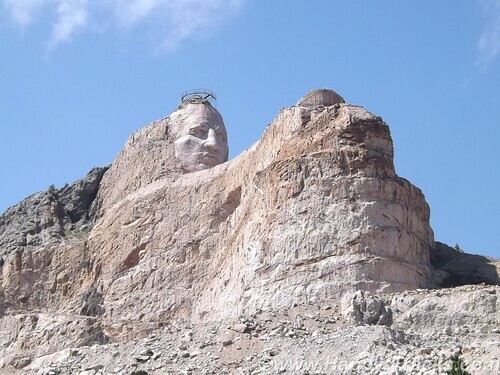 Work subsequently began on the next phase – the horse’s head, 66.75 meters high. Although there is still no estimated completion date, Ruth never lost her faith that her husband’s vision would eventually be realized; she said her wish was to “live more years than possible because I would love to see it finished”. We spent the night in Custer SD. 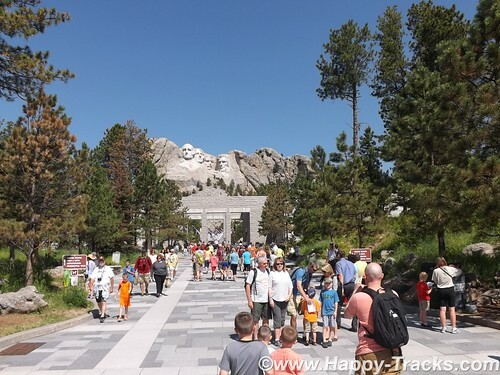 This entry was posted in Alaska trip, Uncategorized and tagged Badlands, Crazy Horse, family, friends, granite, happy tracks, memorial, Mt. 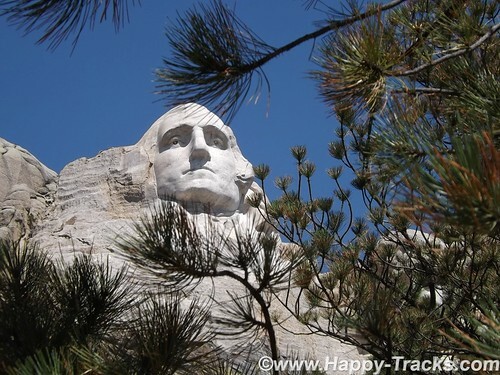 Rushmore, national park, South Dakota, travel by Keith. Bookmark the permalink.